The No. 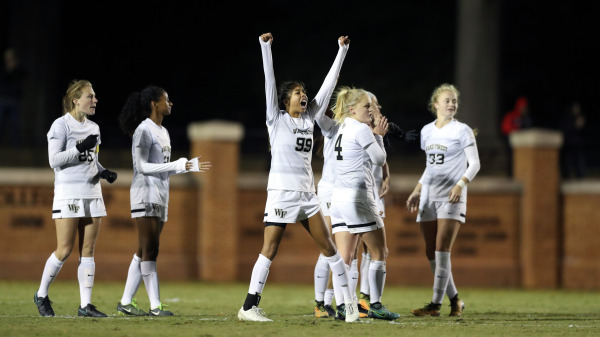 24 ranked Wake Forest women’s soccer team has moved on to the second round of the NCAA Championship with a win over No. 15 ranked Georgetown on Friday, Nov. 10 at Spry Stadium. The Demon Deacons played the Hoyas scoreless through regulation and extra time, leading to an emotional penalty kick shoot-out to determine who would advance to the third round of the NCAA Championship. Wake Forest ultimately defeated Georgetown 2-1 in penalty kicks, and will now face No. 3 Penn State on Friday, Nov. 17 in the neutral site of Morgantown, W. VA. Neither the Deacons nor the Hoyas had sustained success on offense in the first half, with only four combined shots. Wake Forest junior midfielder Bayley Feist had both of the Deacons’ shots, and Wake Forest senior goalkeeper Lindsay Preston made an exceptional save in the 18th minute of the first half to keep the scoreboard empty. Georgetown slightly outpaced Wake Forest in the second half with five shots to the Deacons’ four, in addition to a five to one corner kick advantage. The overtime periods saw multiple chances for each team, though neither could break through. The first Hoya penalty kick was saved by Wake Forest junior goalkeeper Nonie Frishette, who replaced Preston in goal for penalty kicks. Senior midfielder Maddie Huster scored her penalty kick, followed by a Hoya make and a Deacon miss to even the score at 1-1. Feist eventually made the Deacons’ fourth kick, and two prior Frishette saves gave Wake Forest the win. Wake Forest is playing in their first NCAA Tournament since 2013, and has enjoyed a high level of team and individual success this season. Four players earned All-ACC honors, including Lindsay Preston, Maddie Huster, Bayley Feist and Vicky Krug. Preston and Huster were named to the All-ACC second team, while Feist was named to the third team and the freshman Krug earned Freshman team honors. Meanwhile, the Penn State’s womens soccer team has earned six Big Ten postseason honors, including four all-Big Ten awards. Wake Forest will have to contend with the individual brilliance of the Nittany Lions’ star forwards, but if they keep up their defensive focus, a positive result is possible.